Think of Indonesia’s perfect beaches and idyllic island life, and Bali and Lombok immediately spring to mind. Their beaches and other island offerings may still rank among the world’s most stunning and exotic, but seclusion is an increasingly rare commodity. Perhaps you’ve tired of the ‘tropical paradise’ picture perfect postcard retreats you love, which are still undeniably beautiful, but now spoilt by unkempt beaches and more likely to feature other red-faced foreigners more interested in their Bintang Beer than endless stretches of white sand and palm trees. Or perhaps as a seasoned Southeast Asia old hand you’ve seen it all, and island-hopped enough so much so that it’s the rare few special island or resort that can stir up any excitement at all. One of the best things about Indonesia that’s easy to forget, especially after getting caught up in the big city lights of Jakarta, is that the country is in fact also the world’s largest archipelago, among its other claims to fame, which puts more than 18 000 islands at your disposal — 6000 if you count only the inhabited ones. And the fact that few international travellers bother to venture elsewhere beyond the usual suspects only means more space for the rest of us. 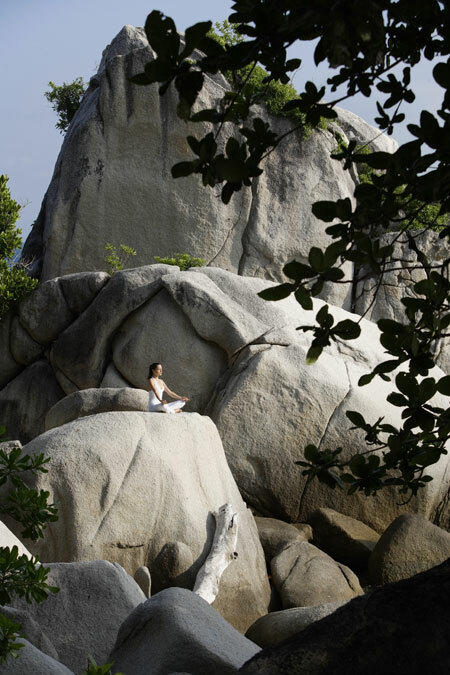 Closer to Singapore than to Jakarta, Nikoi island off the east coast of Bintan, is Riau’s best-kept secret. The private island is owned by a small group of expatriate owners who’d spent decades working in the region. The vacation spots in the vicinity fell short of their expectations. Bintan and Batam’s resort selections offered mostly mass tourist hysteria, and the very idea of a ‘resort’ was synonymous with uniform mediocrity and packaged tourists. 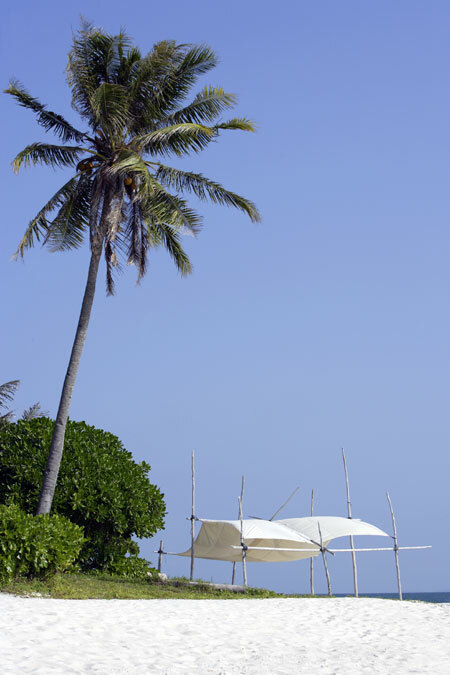 They accidentally discovered the island of Nikoi on a boat trip from Bintan, and the rest is history: building up the the island’s slowly and sensibly, there are a mere six houses on the island at the moment, and plans in the pipeline for just nine more. If you’re here for privacy, seclusion, and a spot of romance, this is precisely it. Zipping over from Singapore by ferry, we whizzed through the VIP lounge on arrival, the seaport equivalent of ‘fast track’ immigration clearance. An hour later we were in Kawal, site of a small Nikoi-bound jetty. My measure of how special an island is is pretty rudimentary. How much does it makes my jaw drop, in the first minute or so when the island comes into your line of sight, and does it make me think “I’m so lucky to be here”? Islands like Koh Lipe do that to me, while Phuket and Koh Phi Phi never do. And now, onboard Nikoi’s homebound classic wooden launch boat “Mana”, as we approached Nikoi I felt what owners Andrew and Julia Dixon must have felt when they first spotted the island in 2001: this might be paradise. 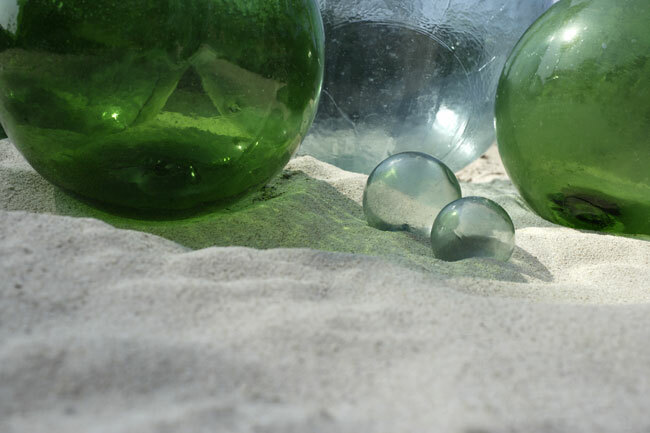 There was no one on the beach when we landed except the affable Yogi (“Call me Yogi Bartender!”) and his crew — amazing. Yogi mixed us a much-needed welcome drink, and the mellow sounds of good jazz never stopped. Some islands just exude a wonderful vibe without having to try too hard, and Nikoi was one such place. It felt more like stumbling into someone’s Robinson Crusoe island, not the least bit like the impersonal resorts we’ve all grown used to. And it kept getting better. Each one of the houses was a sturdy two-storey beach house. Downstairs, a wonderful chill out space with day beds and a bar; upstairs, a comfortable, spacious bedroom with the balcony opening out to the ocean. The houses, like most other architectural elements on Nikoi, are the pride and joy of designer Peter Timmer, who was part of the original founding party. 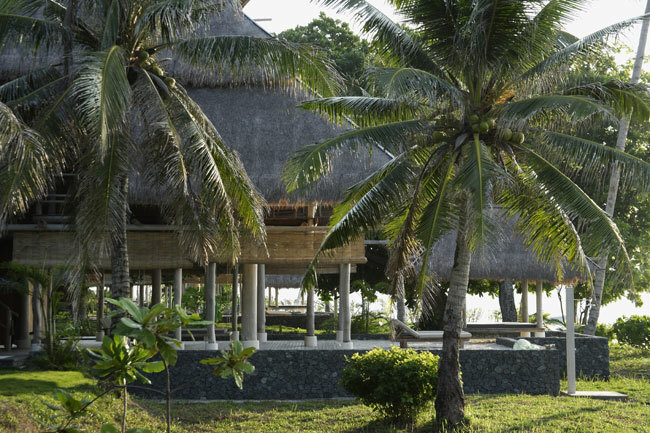 Having lived in Bintan for decades and passionate about the natural surroundings of the region, he handcrafted the houses from driftwood, and emerged with distinctive double vaulted roofs for each. The way the houses are built, says Timmer, makes the very idea of air-conditioning unnecessary — the houses are kept cool naturally, for hot air escapes through the chimney-like roofs. I haven’t been in a hotel like this in a long time, in fact I wasn’t even sure I could call Nikoi a ‘hotel’ or a ‘resort’. It was everything it promised to be: secluded, private, charming, quiet… and different. This was barefoot luxury at its best. The houses in their smallest configurations, the one-bedroom houses (they also come in two and three-bedroom) had at least 100 square metres upstairs, a far cry from tiny standard hotel rooms. Instead of opulent five-star luxury, accommodation is all about adventure and charm — “Luxury Survivor”, according to its owners — and every inch of the rooms, with natural touches of stone and wood everywhere, stood out. Within five minutes of being there, I felt like I never wanted to leave. The food was fresh and seasonal, with the items on offer depending on what’s available that day transformed into fine dishes under the watchful eye of Nikoi’s expert chefs. The wine list was short but commendable, and Yogi Bartender’s cocktails delightful. Local flavours and dishes, barbequed seafood and unbelievably sweet tropical fruits, were served three times a day at the dining room or sea-view clubhouse, with the occasional live jazz act on hand to provide entertainment. At other times, meals can be served in the privacy of your own beach house or right on the beach. Whatever you end up doing in Nikoi one thing’s for sure: there won’t be many people around to cramp your style. The island can hold up to 60 people, but in reality very rarely ever even reaches half of that. If long lazy dinners, pina colada in hand, gets too much for you, the fine people at Nikoi will be glad to help. Pick up snorkelling or fishing equipment, and head for the sea — the waters off Nikoi are as lovely and pristine as the island itself is. All equipment for activities are provided free of charge, and on a slow day if you feel like sailing — but can’t — one of the staff will be happy to take you out to sea on one of the lasers they own. Land-roving adventurers may prefer unwinding at the beach or the lovely swimming pool, or if that gets stale, beach vollyball or a nature walk around the island to witness the beautifully conserved flora and fauna are always viable options (if you have children, ask about special activities for kids — there are too many to name). All of which was activity enough for us for three days. We woke up every morning in Nikoi to a view of the open ocean and trundled about barefoot everywhere: beach, house, beach, house, pool, house, bar, clubhouse, and when we decided to attempt to be ‘active’, ended up stuck at sea in a laser neither of us could operate (but that’s another story for another day). The food was good, and the beach, perfect. In a short period of time Nikoi’s become the best-kept secret you only want to tell your favourite people about, and is already becoming increasingly harder to book, but it’s easy to see why. This could be the new paradise. Via Singapore: Numerous ferries depart from Singapore’s Tanah Merah Ferry Terminal for Bintan, daily. Upon arrival at Bintan’s ferry teminal, Nikoi’s transportation package arranges for VIP clearance at immigration, the car to Kawal, and the boat ride to Nikoi (return). Via Jakarta: Riau Airlines and Sriwijaya Airlines fly from Jakarta to Tanjung Pinang, Bintan’s main town. Upon arrival, transportation can be arranged towards Kawal, and to Nikoi. Nikoi: www.nikoi.com Everything you need to know about the island, accommodation, activities, and bookings. Adrianna Tan is a Singaporean photojournalist and new media producer based in Dubai and Kuala Lumpur. Her “Postcards from London and Dubai” travelogue can be found online at http://fortylove.tv. This article was published in the print edition of Kabar in March 2009.